Lioele | May our skin grow beautiful, as we grow wiser. There’s no surprise here. 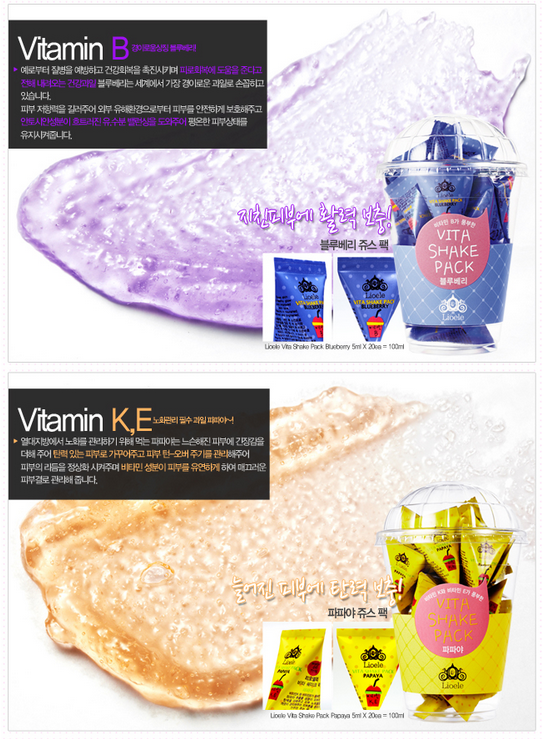 The Korean cosmetics market has been known to introduce unique, innovative products – especially when it comes to sun care products in which they place great importance. Introducing Liole Powdery Sun Chiffon SPF 50+ PA +++ ( 리오엘리 파우더리 썬 쉬폰) , a sunscreen with a very unique formulation – Elastic Bubble Gel. This unique sunscreen contains Mango Butter, Shea Butter, and Grape Seed Oil to moisturize the face and protect it from external damage. It uses silicone cross polymer and Dextrin to create a unique texture. Dextrin is a polymeric carbohydrate which are formed during the hydrolysis of starch to sugars by heat, by acids, and by enzymes. Dextrine is known to give cosmetics a sort of fluffy whip-cream texture. It is also used in Tony Moly’s Whipping BB Cream. It also has water binding properties. It doesn’t feel sticky at all, and smoothens the skin to ensure your skin’s comfort. It is also waterproof! Korean cosmetics company are getting really creative with their products! Introducing the Lioele’s Vita Shake Pack. 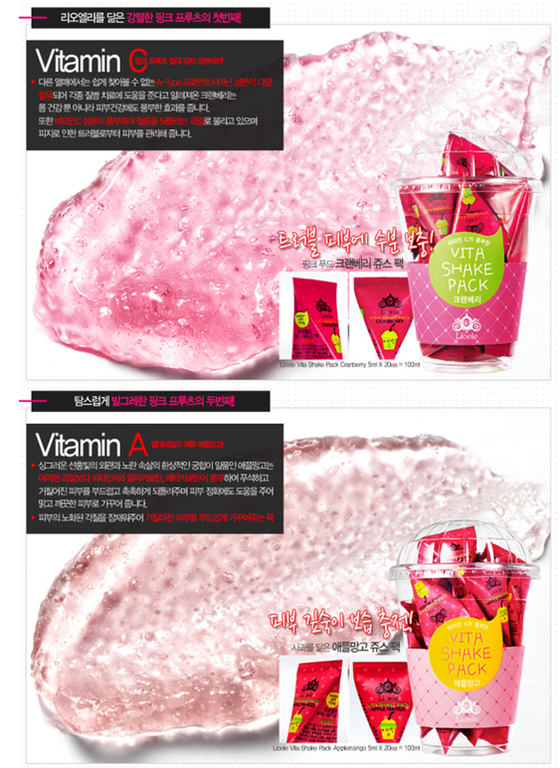 This is a wash off mask, which is packaged in from of a ‘fruit shake’ and contains 6 different flavours. 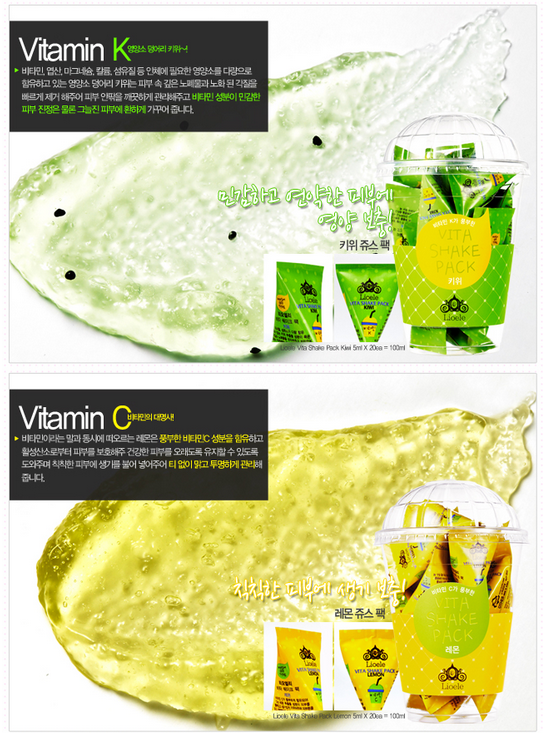 Each ‘fruit shake’ contains 5ml x 20 mini masks and is convenient to bring around. They even have fruit grains in their mask! 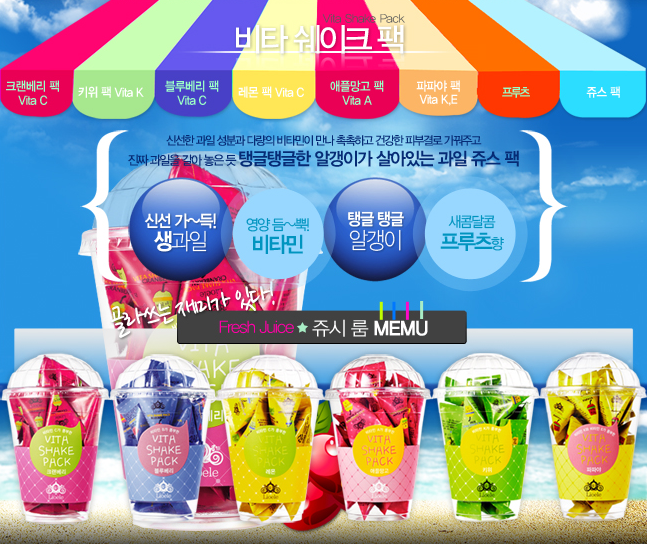 The 6 shake flavours are Cranberry ( Vitamin C ), Apple & Mango ( Vitamin A ) , Kiwi ( Vitamin K ), Blueberry ( Vitamin B ), Lemon ( Vitamin C), and lastly Papaya ( Vitamin K + E ). The masks can be mixed together, or used according to your mood and needs of the day. Contains a phyto-soothing complex which features flower extracts that soothes the skin.